"All he really cares about is access to power." 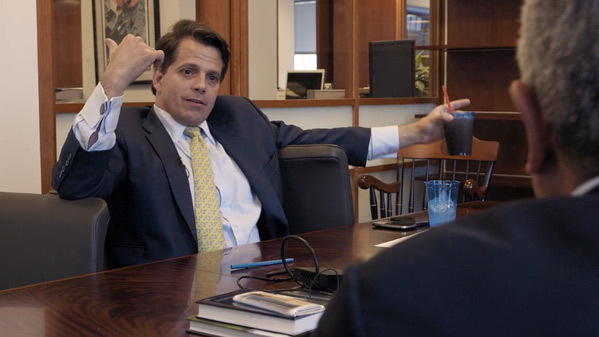 Giant Interactive has revealed the trailer for a documentary titled Mooch, about the infamous White House Communications Director named Anthony "The Mooch" Scaramucci. Made by doc filmmaker Andrew J. Muscato (Doped: The Dirty Side of Sports, Muhammad Ali: A Life), he was already working on this well before he ended up getting the White House job. "Anthony, I always thought was an interesting kind of creature of Wall Street, who I thought, through a film, I could kind of introduce to the world. But recently he kind of pre-empted me and introduced himself," Muscato explains. The rest is history. And he was there to capture it all. Mooch is being released very quickly straight to VOD later this month, if anyone wants to watch. And this isn't a puff piece - it thoroughly criticizes him. Anthony "The Mooch" Scaramucci may have ended up as the shortest tenured White House Director of Communications, but he sure left a big impression. Filmed over a four-year span, Mooch tells the Only-in-Trump's-America story of an irrepressible hedge fund manager who rose from humble beginnings to stratospheric heights - only to watch the world laugh as he tumbled back down. Mooch is directed by doc filmmaker Andrew J. Muscato, director of the films Branca's Pitch, Doped: The Dirty Side of Sports, and Muhammad Ali: A Life previously. The film has not premiered at any film festivals or otherwise yet. Giant Interactive will release Muscato's Mooch direct-to-VOD starting on October 23rd this month. Interested?